Why we use Per-Units in Power Systems, Part 2d. 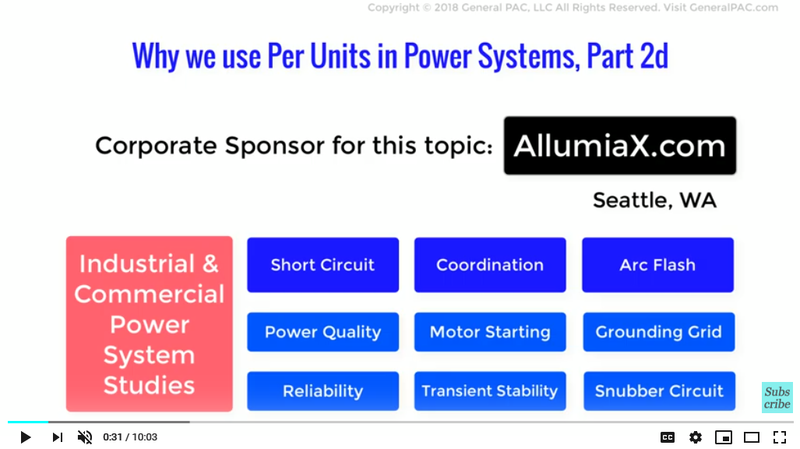 In this video, we will demonstrate another advantage of using Per-units in Power System calculations. This aspect is an extension of the previous video. In a power system, multiple transformers result in multiple voltage levels at different points in the system. 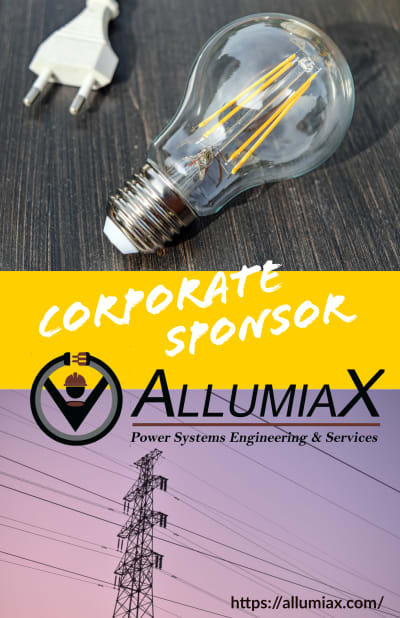 Per-unit calculations ease the analysis of such systems by eliminating these multiple voltage levels and bringing the impedances on both sides of the transformer on a single scale. We demonstrated this aspect in detail in Part 2c, with a single transformer. Here in Part 2d we will consider a power system with more than one transformer, thus tackling multiple voltage levels. And for this, we will take an example from the book Power System Analysis by John J. Grainger (International Edition 1994). So, let’s solve this question. Keep in mind this is a single phase system so the base impedance calculations are different as compared to a three phase system. 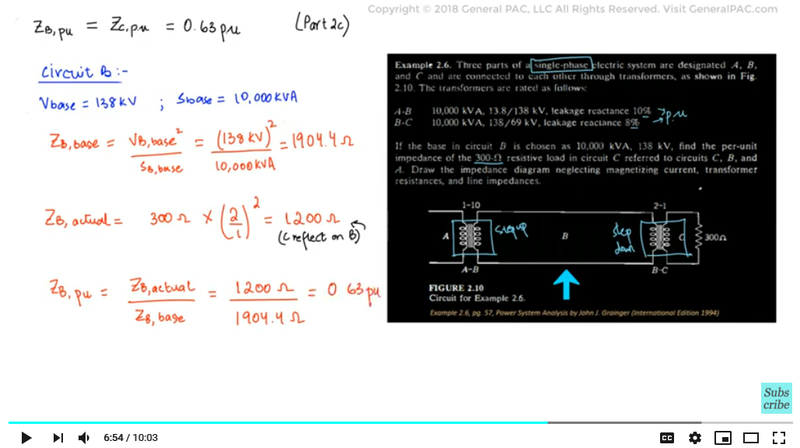 Since we are given the resistance in circuit C, we’ll solve for per unit value of that resistance at the base voltage of 69 kV. Circuit C also has a base value of power of 10,000 kVA so the base value of impedance becomes as follows. Despite solving this answer, we will go through and show the advantage of using per units. Because the selection of base in various regions of the system is determined by the turns ratio of the transformers, and because the base KVA is the same in all regions of the system, the per unit impedance of the load referred to any regions of the system will be the same. This will be illustrated in the remaining part of this tutorial. 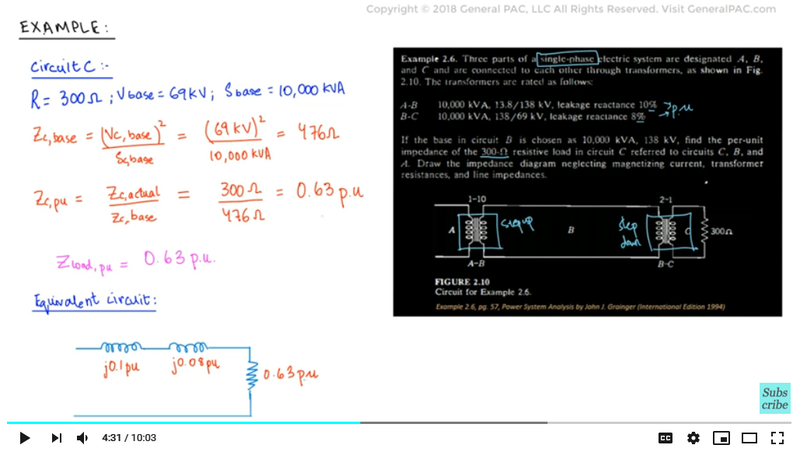 We have calculated the per unit impedance of the circuit referred to Circuit B, and we also know that the per unit impedance in Circuit B would be equal to the per unit impedance in Circuit C i.e. 0.63 p.u. as described in Part 2c. Now if we were to calculate the actual value of impedance in circuit B we would multiply it with the square of turns ratio of 2:1 and the actual value is 1200 ohms. 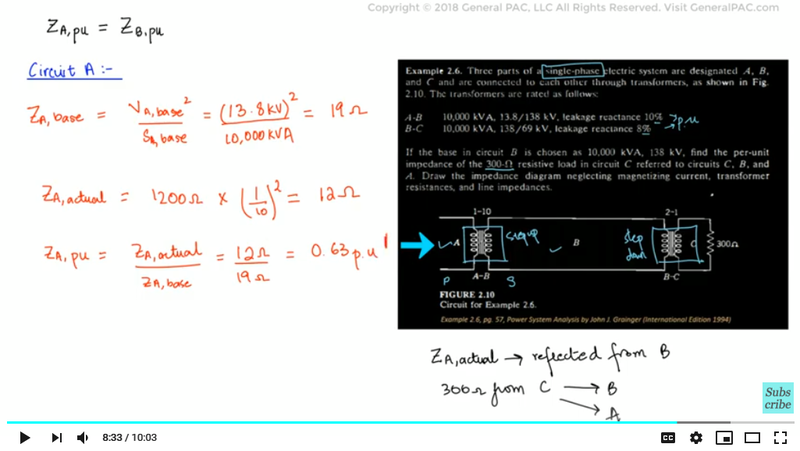 So, here we have proved what we learnt in Part 2c… which is that per unit impedance on HV side and LV side of the transformer will be exactly the same just like how Z_(C,p.u ) and Z_(B,p.u )are the same. Now if we notice, we can see that Circuits A and B are the primary and secondary sides of the first transformer, respectively. Logic says that the per unit impedance of Circuit A will be equal to that of Circuit B. Let’s find out if that statement is correct. Notice that the multiple voltage levels are eliminated by making use of Per-units and the circuit consists of just impedances that have been reduced to a single voltage level that is common to the entire system. We can also conclude that no matter how many transformers and voltage levels are added in a system, we can find the impedance by simply doing calculation for only one side of one transformer. See! How per unit calculations can drastically reduce the mathematics involved. 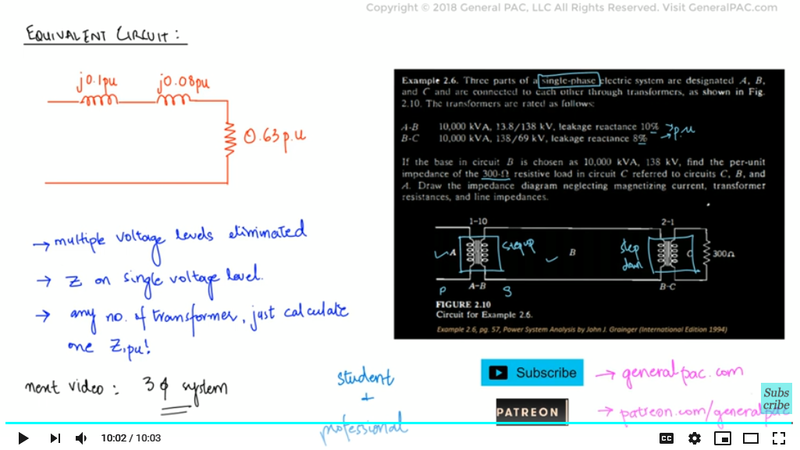 In the next video, we will be dealing with an example for per unit systems in three-phase systems calculations. We hope, you have a continued interest in this topic and series as a student or professional. We also hope you find this content useful and enlightening. Please consider subscribing to GeneralPac.com or becoming a patron on patreon.com. GeneralPAC.com. Making Power Systems Intuitive and free to everyone, anywhere, everywhere.